WaterSound Beach is the exclusive gulf-front neighborhood of this custom-built home, designed by renowned Nashville architect Michael Marchetti. Occupying a generous corner lot, this extraordinary six bedroom residence makes an impressive statement with its lookout tower, glorious gulf views and private pool. These merely hint at the attention to detail within. hardwood floors, limestone and marble flooring bring a sense of permanence to this otherwise modern home which includes soaring ceilings in a synergy of rooms designed for relaxing, entertaining and having fun. The kitchen is a chef's delight, complete with Thermador appliances and oversize island breakfast bar for informal meals.Hang out around the built-in wet bar making cocktails or spend quiet time in the Living room curled up in front of the brick-built fireplace. Two master suites boast private sleeping porches for afternoon naps or night-time slumbers beneath the starry sky. In addition, two guest suites, A bunk rooms, bonus room, and a carriage house offer endless potential for gatherings and beach vacations in all seasons. 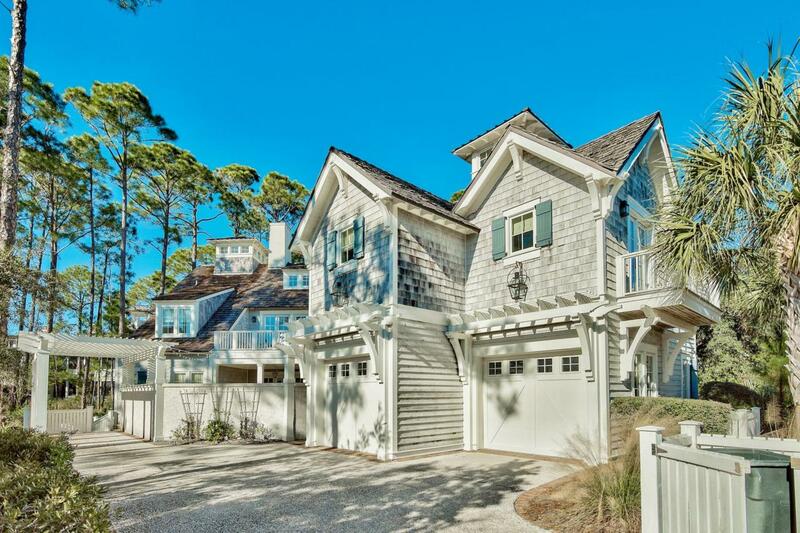 WaterSound Beach offers the pinnacle in luxury amenities. Enjoy a pleasant amble along the private sandy beach, accessed via meandering boardwalks through the natural dunes. Head to the exclusive Beach Club for drinks and casual dining with friends after a refreshing dip in the zero-entry swimming pool. Nearby, Deer Lake State Park offers hiking and recreational activities in a natural Florida environment while Rosemary Beach boasts charming boutiques, al fresco dining and live entertainment.